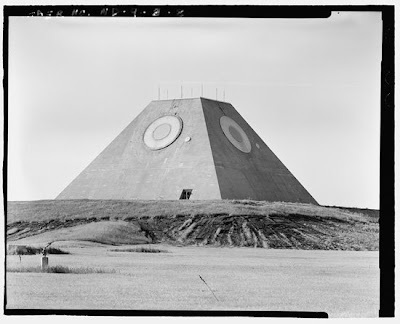 Having grown up in the flat-ness of North Dakota, and spending 20 winters or so there through the height of the Cold War, I just had to share the recent post from Pruned that outlined an amazing landscape-art/homeland security from an anti-ballistic missile complex. 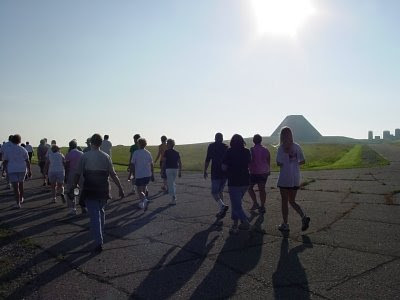 The project stems from an installation for the Safeguard Program - a short-lived program from the 1960's to protect ICBM silos throughout the plains. 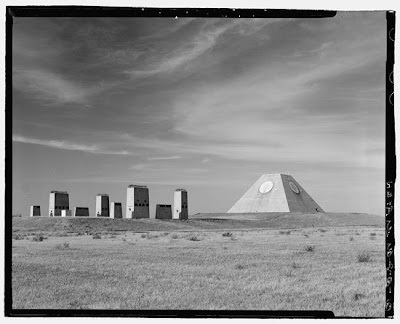 Located in Nekoma, ND (near Langdon, like that helps) the facility photos come to Pruned via "... the HABS/HAER collections in the Library of Congress comes these gorgeous photographic documentations..."
A little more digging found an interesting article from Lone Prairie Art Works, entitled Nixon's Folly. The name comes from the origins in the Nixon administration. 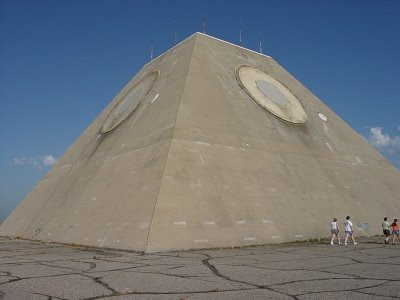 Some more on the form: "Nekoma's pyramid rises from the plains like a prairie iceberg. Most of it's cyclopic structure is buried below ground, leaving only the tip to poke through and be seen. According to our tour guide, one of the few men still taking care of the abandoned site, the interior of the structure has been stripped bare, but is so huge and cavernous that many of the hallways and passages deep inside have their own atmosphere. He told of how, on certain days, some hallways have fog rolling about inside. There is also much water, particularly since the water table in the region has been high since about 1993." The beauty of these structures is the striking form - accentuated by the utter flatness of topography in North Dakota - an endless horizon that is both mind-numbing and amazing. 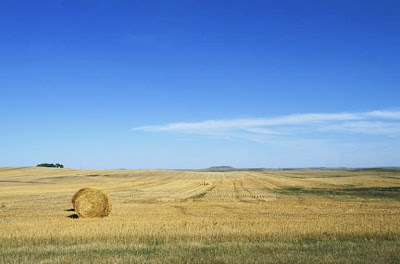 My memories were always sort of a hypnosis as field after field of wheat, soybeans, or sunflowers rolled by, along with the persistent and level-thin horizon. This is something I never really truly appreciated until living in Oregon, where stunning mountains, forests and hillsides offers wonderful views - but rarely this thin line as far as the eye can see. 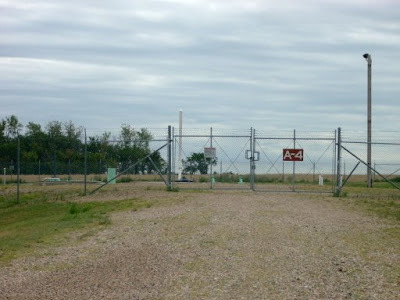 I admit I've never seen the structures at Nekoma - and it's kind of disappointing (although I'm planning a trip in the fall - so maybe a side trip is in order). It's fascinating that this structure may be one of the most significant structures in the state - in terms of height and mass. With a low mountain range as the highest points of topography - maxing out at around 3,300 feet in elevation as a major feature, and a stunning valley topography as the other significant topography, the glacial scouring that flattened most of the state 10,000+ years ago definitely makes a statement. 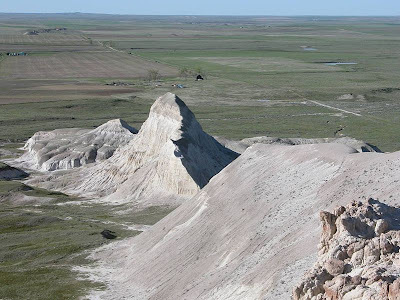 In fact the high point in the state is a mere 3,506 ft - White Butte and it's distinctive shark fin make for a very horizontal state. 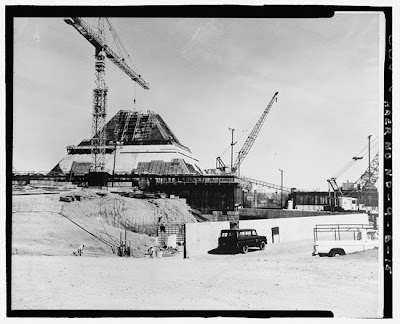 The terrain made larger structures very visible - but the most insidious cargo hid underground, in the architectural equivalent of a brown paper bag. 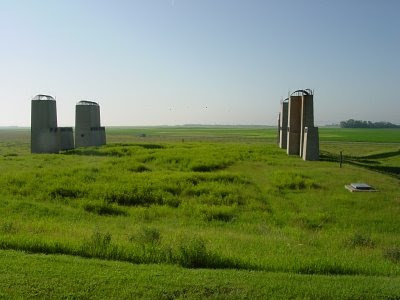 The interesting part of the landscape of North Dakota is that it is both possible and impossible to hide missile silos - and any traveler of a back road will see the familiar site alongside - thin gravel road, rectangular chain link, small buff colored out-building, a couple of antennae, and a Letter-Number designation. 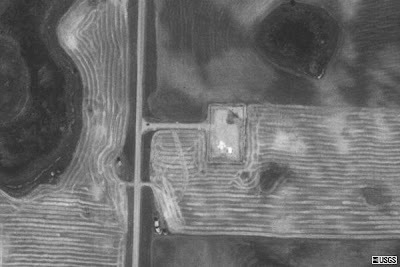 See below for a typical entry shot, (a protest), and aerial photo showing the innocuous looking sites amidst plowed fields. Overall it's interesting to see how ubiquitous these landscape elements were - even in their stealthy locations in a sometimes featureless landscape. The last time I visited North Dakota - it was the week of 9/11 - and a trip from Minot to Teddy Roosevelt National Park showed no traffic - save for armed humvee's with machine gunner at the ready on top. It was as close to some form of apocalypse I've felt. It was not nice. "I had to relearn the horizon without those lights being there. They'd been there my entire life. Now I, along with many other people here including my father, wonder what the plans for the buildings on this much smaller site are, and if we'll get a crack at them since it was on our land. I know of more than a few farmers who have inquired about the metal quonset-like structure. The realization is, unfortunately, that by the time the military gets around to the issue, the buildings will be fit for the bulldozer and not much else. They've been empty for about ten years.But I still miss the lights. Texas has their Friday Night Lights and football. We had our nuclear missiles.Nostalgia. 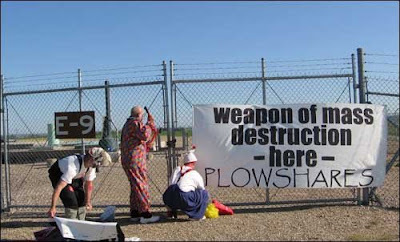 It can even make you miss nukes."